Crossroads' owner Bob Crossman (center) lost his dance partner in May. The sign outside Crossroads Country Western Dance Club in Post Falls reads "End Of An Era, Last Dance November 21." It gets me thinking about missed opportunities — like learning to dance for my wedding — and the ever-changing rural way of life in the Idaho Panhandle. My mental soundtrack set to Lee Ann Womack's "I Hope You Dance," I meet with Bob Crossman, who started Crossroads with wife Patricia "Pat" Crossman 19 years ago. While on a house-hunting trip, explains Bob, Pat went dancing at Kelly's, an '80s-era Western joint (that eventually became Big Al's before closing this year). Pat brought her enthusiasm home to Bob in Wisconsin, where they'd go dancing three or four nights a week. When they retired to Coeur d'Alene in 1989, they looked to recreate that experience. Soon they weren't just dancing; they were teaching. Combining their past careers in business with Bob's prior Arthur Murray dance instruction, the couple conducted dances throughout the Panhandle: Hauser's Rainbow Inn, the Falls Club in Post Falls, the Steelworkers Hall in Kellogg. It was on the homeward trip from such an evening when black ice on Fourth of July Pass caused an epiphany. "We thought, 'We should have them come to us,'" says Bob. They bought the former Sunshine Nursery and converted it into a cozy place where people of all ages and abilities could learn to dance in a smoke- and alcohol-free environment. Many of the folks who followed the Crossmans' dances pitched in with the new building, like James and Barbara Fillmore. The Fillmores not only met through dancing, they married at Crossroads, where Pat did the catering for such events. "The one thing Pat wanted was a place single women could feel safe," says Barbara, who greets many familiar faces arriving Friday night for the last dance. Many of the 60 or so guests bring covered dishes of food, since Pat is no longer around to run the kitchen. She died in May after a long illness. Her legacy lives on, though. According to Bob, at least 18 couples met and married through Crossroads; all but one is still together. That includes Lori Adams and her husband, Chuck, Pat's uncle. On Friday, the couple wait for a partner dance, which won't happen until around 9 pm, after two dance lessons. 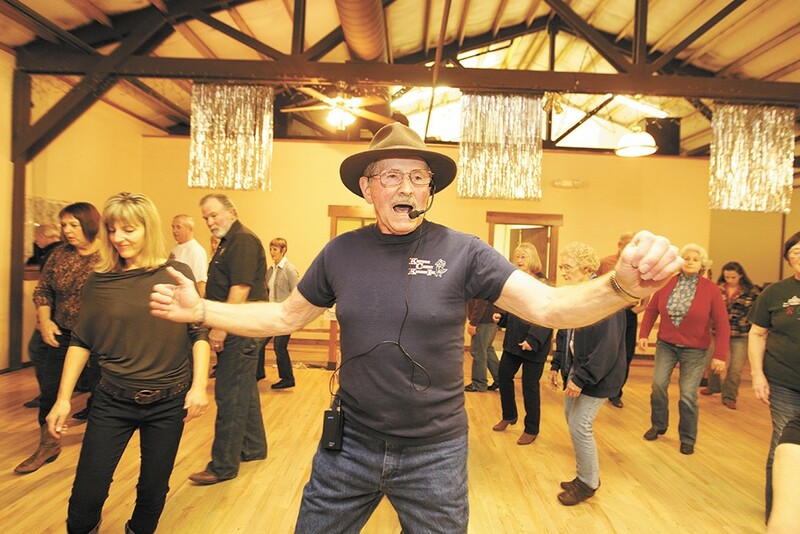 When Bob signals for the second lesson, the dance floor fills with three dozen men and women, whose ages range from 20 to 80. Dressed in jeans, black boots, a dark T-shirt and his trademark Australian-style hat, Bob coaxes the dancers through a complex 64-count series of steps. No music yet, just Bob talking through steps: rock-step, swivel-swivel, right-left-right, kick-ball-cross. Laughter, some hooting, a few near misses as dancers work to learn the steps. The energy shifts; it's the beginning of the end — the last lesson, followed by the last dance. From the doorway where he greets guests and collects the $7 cover, Paul Schwartz watches his wife, Linda, on the dance floor. They also met through dancing and will celebrate their 11th anniversary this month. Besides being fun, says Paul, dancing helped his marriage. "Because you have to move ... in syncopation ... you learn to read body language really well." He talks about the great community he and Linda have built through dance, and all the fun and healthy things they do together. From the dance floor, Bob is winding up the lesson and the music is cued to a dance hall favorite — an upbeat line dance called "Stray Cat." The energy shifts again; it's time to get a little food, celebrate and line up to dance. "What will you miss the most?" I ask Bob when I meet him. I wonder if he's thinking about his partner in dance and in marriage. Later, as we say our goodbyes, he nods towards the dancers. "Family," he says, smiling.